Russian Military To Order At Least 36 Additional Su-30SM Multirole Fighters By End Of 2018 5 out of 5 based on 11 ratings. 11 user reviews. The Russian military is going to order at least 36 additional Su-30SM multirole fighters, the Russian newspaper Vedomosti reported on August 16 citing a source in the military industrial complex. According to the Vedomosti report, the contract on additional multirole fighters will be signed by the end of 2018. The source added that Irkutsk Aviation Plant will be capable of producing 12-14 aircraft per year in the framework of this agreement. Since 2012, the Russian Defense Ministry has received 116 Su-30SM multirole fighters. 88 of them entered service with the Russian Aerospace Forces. 22 – with the Naval aviation. First of all RuAF only recieved 108 out 116 that have been ordered. Also the plant is capable of producing much more than 12-14 planes per year. In 2015 it produced 31 Su-30SM. 22 for RuAF 5 for Ru Navy and 4 for Kazakhstan. What they are talking about is that they will produce 12-14 for Russia. The rest of them for export. Russia has older Su 27,…some with mid life upgrades which do nothing . Syria could use at least 30…. Bring in China with their Aviation experience from Su 27 contracts. Syria’s ATGM Jamming systems were very effective. Syria has the capability to create technology to compete. It’s frustrating they are held back with aircraft that might get lucky vs IAF . IMO….it’s the Radar and missile ability to prefix thru various search modes which can get at IAF, US/NATO. Some nation like Syria could really change the Airspace access game. I’m impressed with Kalibr. ..
Would like to know what Russia’s new Gen air to air missiles can do. Israhell would respect Syrian Mig 29s if they had the radar and missiles on the rails to nail IAF vulture fleeing for home. Total numbers of Suk 30SM for the RAF by 2025 will be a lot higher, quite likely after 2020 Iran will start receiving an export version of this aircraft, MIG 35 is going into production soon, a lot sooner that scheduled, with the emphasis of being able to outperform and outgun F35. they will not have much of a problem as far F35 goes. Not a hard task, to outperform a flying coffin. The emphasis was on technological tools available on MiG 35 that surpassed the F35 technology, Zhuk AE AESA radar, and a very passive optical locator system that can see stealth at significant distances and aim weapons weapons as well. The optical locator system consists of o series of powerful and complex optics with IR capability that sees everything. It is claimed that MIG 35 can become invisible to the radar using its EW package. I got so excited when I saw “Total numbers of Suk 30SM for the RAF by 2025”, but you meant the Russkies. For one slight second, I thought we Brits were getting some planes in our RAF. PS I believe it is RuAF (thanks to “ult” below). 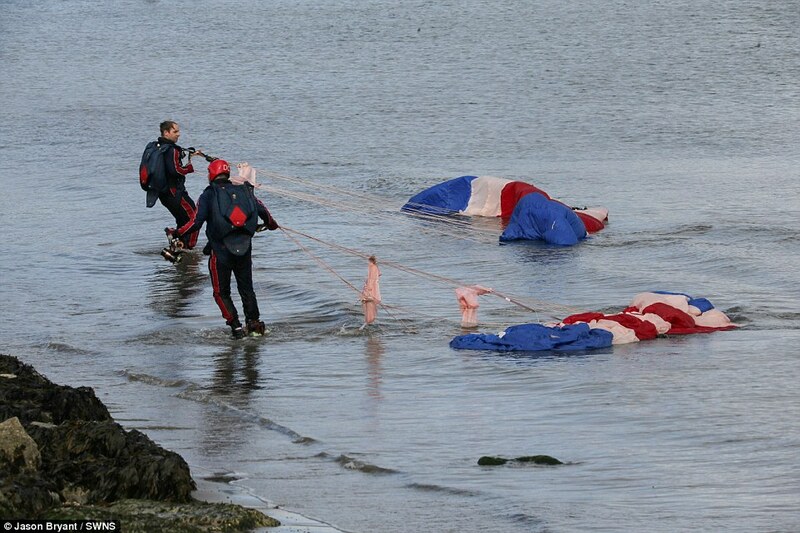 Did you see the British RAF parachute display team that accidentally landed in the sea this week Al. NOOOOOOOOOO, I haven’t seen it and I cannot find it with a search; any chance of a link please, pretty please. Didnt the Yanks do something stupid like that in one of the South American Countries …..they landed in some sort of mud field. 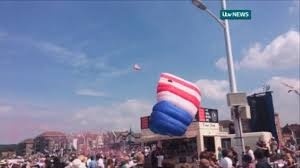 Old pix of RAF parachutist hitting the burger grill. Thanks. I somehow missed it and I wished I still had. Here is the video and end result…. what a …………!!!! I accept there are freak gusts of wind etc but they had steerable chutes and were presumably the best the RAF has. I do hope a few White Helmets are on board as they have Hollywood style experience in fighting fires. Yes the Russkies, my oversight, the Britts can opt for fewer F35s and buy some large Sukhoi fighter bombers with long ferry range that will help the patrol the northern Atlantic. No worries. The rest of your comment is like a dream for me and many. But nope, we buy Yank crap, for some bizarre reason. No bizarre reason. It’s about Anglo brotherhood. The Ruskies are Slavs. We know that in case of war…all runways of NATO bases close to Russia would be destroyed with kalibr missile…then NATO jets would have to fly long distance…avoid S-300/400 and others system…then the remain group to confront with SU-30/35….bad news for NATO airforces…. More like the Iskandar for pinpoint accuracy. They have an accuracy of about one meter I think . .
With tactical nukes, what’s a meter here or there. I do like the SU-30, its my favorite Russian aircraft. They may need them. The UN Secretary General’s report on a Palestinian protection force is in. And he didn’t drop the ball and is behaving like a true statesman. One of the options is something that I’ve been calling for. Which is a military and police force to secure the Palestinian territories. Either a UN force or a coalition of like minded nations operating under a UN mandate. The US veto can be overruled with UNGA 377A Resolution proceedings to authorize the force. Which can be deployed in the occupied territories with or without Israel’s consent. If Israel withholds consent, then suspending or revoking Israel’s UN membership in preparation for giving it to Palestine should be pursued. Plans and preparations should be made for disarming and disbanding the IDF and Israeli government as part of dejudifying and unifying Palestine and dejudifying our planet to create a Jew free world that will be much better for humanity. The Gaza fence and West Bank barrier wall should be torn down. And Palestinian refugees allowed to return to Palestine to help with dejudifying and unifying Palestine. By Russian standards of not telling all secrets I expect they already have at least 30 more but the other 6 make it possible to make their report of 36 by the end of the year. Then as they will likely move swiftly they may start another batch by October and still be telling the truth.